. I an a true gentleman Pug. I know where to do my business and its not in the house. I love walks and going for car rides. I don’t bark except for that one time the new puppy my foster parents got got to fresh with me. I enjoy being with my owner most of all. I’ll sleep next to you in your bed or on my own bed next to your bed. I love getting attention and being rubbed but i don’t bug you for it. I have just a cute little snore. Not loud. I don’t beg for treats or when your eating. I will quietly sit and stare at you until you give me a bite too. I don’t jump on the furniture or on our guests. I’m Healthy guy and have no health problems. I am a little hard of hearing but i do trend to keep an eye out on you just in case you want me. I’ve never run away but i do like to wonder around my area. I do not shed either. 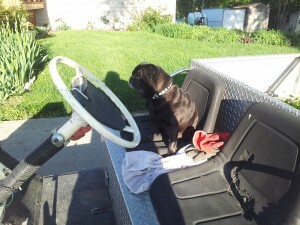 I like to potter around on my foster parents golf cart. I get along with other dogs fine but I’m not real fond of the new puppy. I like little kids but i don’t like then sneaking up on me. I’m just a mature guy looking for love. Will it be with you? Are you ready for a best friend cuz that is what I’ll be. I’m 12 yrs old but don’t let my age fool you.I’m in my prime! I’m a good no great boy! I know everything a good Pug needs to know. I’m not real fond of small kids. I trend to just stay away from them if i can. The only issue i have i guess is that I’m a bit hard of hearing. If your looking for a forever friend that is always cheerful and happy to be with you then I’m your guy. I’m neutered and in wonderful health.